I made these incredible muffins this morning and had to share the recipe, because everyone needs a solid blueberry muffin in their arsenal. They're a little bit fancy and that's what makes them so great. If you bake them for guests, songs will be written in your name. Your fame will spread far and wide. You need to make these muffins. 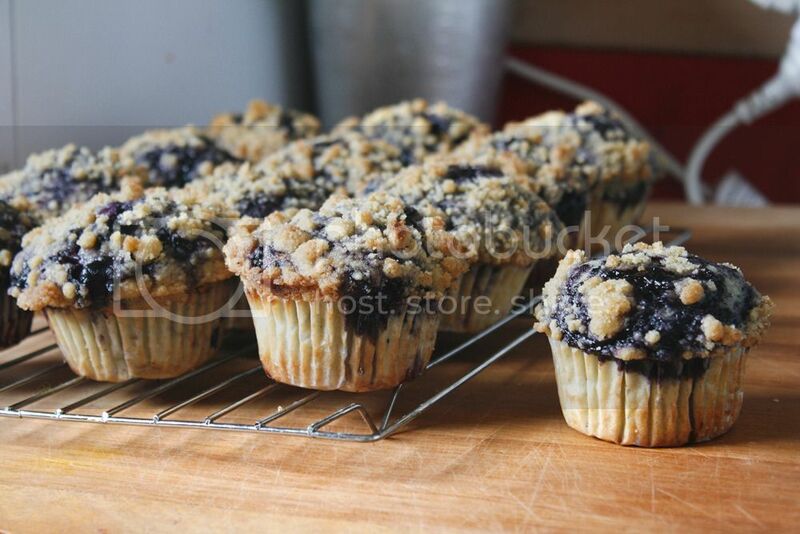 These muffins are swirled on top with a lemon-blueberry sauce and then generously topped with a classic streusel topping. Adjust oven rack to middle position and heat oven to 425 degrees. If your oven cooks on the hot side normally, reduce the heat. Some people have commented that 425 was too hot. I would recommend getting a thermometer for your oven if you aren't sure. Prepare standard muffin tins with nonstick cooking spray or liners. Bring 1 cup blueberries, water, and 1 teaspoon sugar to simmer in small saucepan over medium heat. Cook, mashing the berries with your potato masher or fork several times and stirring frequently, until berries have broken down and mixture is thickened and reduced by about half. This will take about 6 minutes. After the blueberry sauce is cooked add the lemon juice and stir. Transfer to small bowl and cool to room temperature, 10 to 15 minutes. Using a cookie scoop or large spoon, divide batter equally among prepared muffin cups (batter should completely fill cups and mound slightly). Spoon teaspoon of cooked berry mixture into center of each mound of batter. Using chopstick or skewer, gently swirl berry filling into batter using figure-eight motion. Sprinkle lemon sugar or streusel evenly over muffins. Thank you for this sharing. I liked this recipe very much. It is very easy to understand your recopies. I want to know the recipe of red velvet cake.please do post more, I really enjoyed it.do you know how to increase your writing skill? I searched in google before someday. I got an excellent site, there are many expert writers for us if you are looking for a good essay cheap essays writing service is the best.